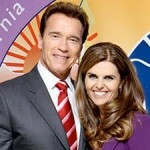 Soon after the revelation was known and acknowledged by Schwarzenegger, Shriver released a statement, that it was a “painful and heartbreaking” for her. As a mother, her concern is for her children. She ask for compassion, respect and privacy for her family, which they are trying to rebuild their lives and heal. Two of their four children posted on Twitter, expressing their love for their family. Shriver moved out of the family’s Brentwood mansion after Schwarzenegger acknowledged the child was his. Shriver has been seen in public for several occasions without her wedding ring. Shriver,now 55, is the daughter of Sargent Shriver and Eunice Kennedy. She met Schwarzenegger the former Mr. Universe in 1977 at the Robert F. Kennedy Pro-Celebrity Tennis Tournament in Forest Hills, New York. The couple married on April 26, 1986, which they have four children, Patrick, Katherine, Christina, and Christopher. The estranged couple’s initial separation statement referred to “a time of great personal and professional transition for each of us” but gave no hint of what caused the split, not until the revelation came.